Scenar – What is it? SCENAR (Self-Controlled Energo Neuro Adaptive Regulator) is a pioneering device invented by Russian scientists for use by cosmonauts in their Space Programme. Scenar therapy is a holistic form of treatment that stimulates the nervous system and teaches it to heal itself. Electrical impulses, the parameters of which are similar to endogenous nerve impulses, are transmitted through the skin to the nervous system. Fast-reacting, informational biofeedback means that each impulse is different from the previous one. SCENAR action influences adaptive processes of the organism and helps to harmonize them. In response to Scenar impulses the nervous system releases neuropeptides. These are delivered into the blood stream and broken down into many compounds that are themselves, bioactive. As a result, homeostasis is gradually and gently restored. Superseding SCENAR Therapy Treatment in my practice. InterX therapy is the targeted application of interactive Neurostimulation to manage and relieve the symptoms of pain and injury. InterX therapy is applied using a hand held device which delivers gentle dynamic electrical impulses and stimulates the skin at the area of pain or inflammation. Interactive stimulation via fixed electrodes is applied to areas of pain or injury. 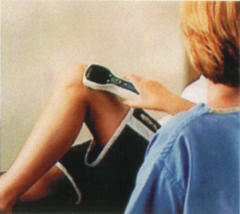 The feedback from the skin in treated areas alters the stimulation that is delivered by the InterX. Primary treatment areas are identified by changes of skin colour, texture or sensation. Because the InterX therapy provides the ability to target treatment on optimal points, the benefit of treatment may be more effective than other methods. InterX Therapy is effective across a wide range of acute and chronic conditions. 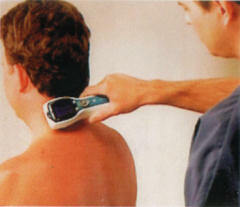 Most people can be treated using InterX Therapy. It is particularly effective in the reduction and management of pain and the resulting range of motion. Caution should be taken when using any electrical impulse devices as they may interfere with other electrical medical products. You have a pacemaker, insulin pump or other implanted functioning devices. You have active cancerous tissues or are undergoing chemotherapy. You have a history of epilepsy or other seizures. InterX is a safe and effective treatment for adults & children. InterX technology is 5100(k) cleared by the US FDA for pain relief and pain management and carries the European CE mark. InterX therapy is a comfortable treatment. The procedure will involve applying the hand held device directly to the skin on or outside the injured or painful area. The sensation of the electrical impulse will resemble a tingling or vibrating sensation. Your practitioner will adjust the sensation as needed throughout the treatment. Typical treatment sessions will last from 15 to 30 minutes depending on the complexity of the condition. Your practitioner will determine the number of treatment sessions required. Generally a course of treatment is recommended over several weeks for optimal results. It is essential to complete the entire treatment course to experience the full benefits of InterX. The full effect of a single treatment is generally experienced within a couple of hours and is often sustained for up to two days or longer. The cumulative effects of more than one treatment may enhance these results. InterX treatment activates the nerve endings that may cause a temporary aggravation of symptoms, light-headedness or tiredness. It is not unusual to experience improved sleeping patterns following treatment. InterX Therapy may be used effectively on its own, or in conjunction with physical, occupational or other therapy. An initial treatment may be 1 hour (£60.00), most treatments last half an hour (£30.00), some may be only a quarter of an hour (£15.00). The contents of this page are for information purposes only. Questions and medical concerns should be directed to your practitioner.